Intracell 7 was formulated with the goal being to create the ultimate performance-enhancing sports drink on the market. 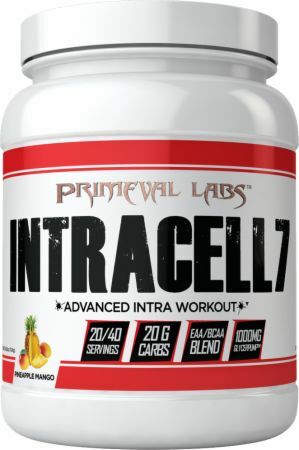 * Each serving of Intracell 7 delivers over 35 g of pure performance ingredients that you will notice the first dose! Why The Need For Intra Workout Supplementation? While much of the discussion surrounding peri-workout nutrition centers on pre and post workout needs, during your workout is the time when nutrient requirements are at a premium. As you bang out rep after rep, muscled accumulate waste products from the repeated contractions, leading to fatigue. On top of that, exercise also increases amino acid metabolism as a result of the greater energy demands. Without all of the EAAs present in sufficient quantities your body’s ability to recover, repair, and grow is severely hampered. And it is here that we see a fundamental flaw present in many products claiming to be an intra workout supplement -- they’re completely missing six of the nine EAAs required for protein synthesis! Carbs fuel performance, it’s as simple as that. Throughout the years, intra workout supplements have included carbohydrates on and off, but for the most part, the carbs included in the intra workouts of yesteryear were slow-digesting and hard on the GI system, leaving athletes feeling "heavy" and sluggish. Glycerol has been a staple supplement of athletes for years due to its cell-saturating, endurance-boosting properties. * However, the forms of glycerol typically used suffered from low glycerol content, poor shelf stability (i.e. spoilage), and clumping. No Intracell 7 Reviews Found. * Percent Daily Values based on a 2000 calorie diet. 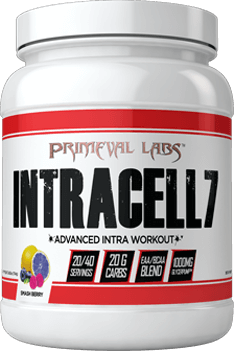 Directions For Intracell 7: As a dietary supplement, take (up to 2 scoops as needed for maximum effect) do not exceed 4 scoops per day. Warnings: Read entire label and obtain clearance from a licensed healthcare practitioner before use. This product is to be used by healthy adults only. Do not use if you have or could develop any medical condition or are taking any prescription drugs. Do not use if you are pregnant, nursing, or may become pregnant. Do not use more than the recommended dosage. Discontinue use and consult a physician if any adverse reactions occur. Keep lid tightly closed and in a cool, dry place. As with all supplements, KEEP OUT OF REACH OF CHILDREN AND ANIMALS.